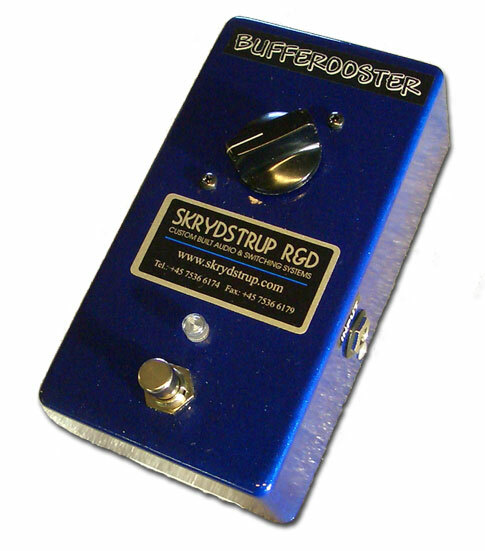 If you're looking for a truly natural sounding clean-boost pedal that won't alter your amp's tone, then try our BR1 Bufferooster. With its clean boosting range of up to +25dB, the Bufferooster is perfect for giving guitar solos the extra level necessary to cut through the mix. Perfect for placing pre-amplifier, or in the effect loop of your amplifier for a clean-boost. When bypassed the BR1 Bufferooster functions as a Unity Gain Buffer, enabling you to drive long cables without any tonal loss or coloration. Unique RFI protection and Silent switching are trademark features on the BR1 Bufferooster. European Export Price: €267,- (excl. VAT). Møgelmosevej 54, DK-6630 Rødding, Denmark.